John Holloway is a native of Ashby-de-la-Zouch, in north-west Leicestershire, and grew up in Coalville, between Ashby and Leicester. Although he has spent periods away from his native county, Leicestershire is the place where John Holloway has spent most of his life. His roots in the County run deep: his father and grandfather worked in the coal mining industry in Leicestershire, and his great-grandfather was superintendent of police in Ashby. John Holloway taught for several decades in the Department of Chemistry at the University of Leicester, conducting research on inorganic fluorine chemistry and noble gas chemistry. These research interests may hint at features in Professor Holloway’s character. Fluorine can form compounds that are helpful – Teflon, for example, is a fluorocarbon – but can also form compounds that explode, and John Holloway has always loved explosions – and how to moderate them! 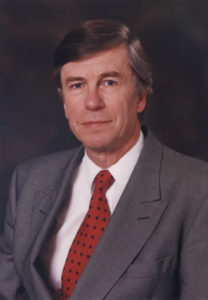 John’s research was articulated in around 300 papers, reviews and books, and its quality has been recognized by a Doctor of Science degree from Birmingham and, later in his career, a Professorship at the University. A Doctor of Laws was conferred on John Holloway in 2010 a degree that is normally conferred for distinguished service beyond the confines of the laboratory. In John Holloway’s case some of that service was within the University, where he served as head of department, and then dean and finally as pro-vice-chancellor. These are jobs that many do in the line of duty, but John used each of them to advance his vision of this university. As head of department he introduced modular degrees, and four years later the rest of the University adopted this model; as dean of science he and his predecessor, John Beeby, worked to enhance a high-quality research culture and, during John’s tenure, the research standing of Engineering and Mathematics and Computing was improved significantly. As pro-vice-chancellor he implemented three changes that have affected all of you: first, he instituted awards for high quality teaching; second, he implemented the University’s scheme for the creation of the “Leicester graduate’, ensuring that every course had in it the key elements that would maximize employment prospects for our graduates; third, he established our virtual learning environment, which has transformed the ways in which the University teaches students on campus and in distance-learning programmes. This is a distinguished record in another sphere of endeavour, but again it is not the primary reason for today’s honour. Beyond John Holloway’s accomplishments as a research chemist and as a servant of this University, there is an extraordinary record of public service.This service takes many forms, one strand of which is the public understanding of chemistry. As you know, the word ‘chemicals’ is often used in a pejorative sense; organic gardeners, for example, boast of not using chemicals on their gardens, and intensive chemical farming is routinely said to destroy native plants and damage the natural world. Contrasting the word ‘chemical’ with the word ‘natural’ is of course nonsensical, because the natural world consists entirely of chemicals, as do we. This perversion of the term ‘chemicals’, which conjures up images of smelliness and destructiveness, damages the public image of a core branch of science. John Holloway realized that the subject needed defending at this level, and has become a prominent advocate of the discipline. His advocacy is local as well as national, so he was a founder member of the Leicestershire and Rutland branch of the British Association for the Advancement of Science, and at a national level has been deeply involved in both the British Association, now the British Science Association, and the Royal Society of Chemistry. The form that this advocacy took in many forums, including presentations for schools and for wider audiences, was that of a lecture, often with his colleague Barrie Raynor, which demonstrated that chemistry could produce heat, light and sound. Versions of this lecture have been delivered to audiences whose total numbers run well into six figures. John would erect a protective transparent screen between himself and the audience, and give a wonderful talk on the joys and importance of chemistry, illustrating his delight in the subject with flames shooting towards the ceiling and explosions so loud that audiences who were expecting them were nonetheless startled. This work on behalf of his discipline includes a lifetime of work for the Royal Society of Chemistry and the chemical community at large. This has ranged from his chairing the Committees which began producing those eye-catching posters that are found on the walls of all secondary schools, and booklets for both graduates and post graduates designed to help them chart their progress through their degree courses, to chairing some of the main boards of the Society and twice serving on its Council, to his work when Chair of the national committee of Heads of University Chemistry Departments, which entailed writing responses to government papers and being one of the five-member Committee which identified the need for and designed the overall shape of the Master of Chemistry degree. This work has been recognized in the award of an OBE by Her Majesty the Queen and the award of the Silver Medal of the Royal Society of Chemistry. At the other end of the spectrum, there is one very revealing piece of public service that has never been acknowledged until this moment. Alongside his role as a champion of chemistry, John Holloway has long been involved in building bridges with the world of art. He launched an international newsletter on the interface between science and art which was eventually subsumed into the international art Journal ‘Leonardo’ for which he acted as British Co-editor for 20 years. He also continues to give lectures on the links between science and art. Indeed, he is accomplished as an artist, and knowledgeable about contemporary visual arts. The annual exhibition of sculpture in the University Botanical Gardens, which is energetically supported by our Vice-Chancellor, is another of John’s enthusiasms; indeed, in 2004 he was part of the team that curated the exhibition. Beyond this involvement in the public face of chemistry and the world of visual art, there is in John Holloway a citizen who has done more than most to bring town and gown together. He has served, for example, as President of the Haldane Society, which brings together people from the city and the university to hear eminent speakers speak on a huge range of subjects with the common concern of joining the world of academic study to the practicalities of life in the City and County.